Avoid inconvenient and expensive breakdowns by having your car serviced at regular intervals! *Note: "Service" and "Repair" are not synonymous. For repairs, please see our Repairs page. An auto service is a routine maintenance performed to keep your entire vehicle working properly. It is a preventative measure to keep all the various systems of your car from breaking down and wearing out prematurely. An auto repair is to fix or replace a part after it has failed, is worn out or is broken. We offer diagnostic service for every system in your car—engine, transmission, steering, air-conditioning, heating, window operation, noises, vibrations. If something is not working properly, we can trace down the source of the problem and make recommendations on correcting the problem. At Haik’s we have a different philosophy than the dealership. We believe the entire car should be checked every time it is serviced, every year or year and a half. That’s a long time interval in which a lot can happen. Haik’s custom service schedule standardizes services for all models of German cars, Mercedes, BMW, Porsche, Audi, Volkswagen, and Mini. As additional service work is needed with the age of the vehicle, we will recommend those services to you as well. Please see Haik’s Custom Service Schedules below. An oil change is not the same as an oil service. While an oil change is one of the service items, it is not a service in the greater sense. The most common brake work is to replace brake pads only or brake pads and discs (rotors) once these parts are worn out. This is called a brake job and is actually a repair rather than a service because it is not performed on a routine basis as preventative maintenance, but is only performed once the brake pads or brake discs are worn out. There is no preventative maintenance a mechanic can perform to make the brake parts last longer. We can only inspect them and replace them once worn out. For more details on Brake System see our Repairs page. Changing the brake fluid is a service item however. It should be performed every two years. For more details see Brake Fluid Exchange below. For Haik’s Custom Service Schedules, see below. Three levels to choose from: Major, Mid-Level and Minor. We offer three levels of custom service for your car: Major, Mid-Level and Minor. All include engine oil change. Mid-level and Major services include complete bumper to bumper inspection of the entire vehicle. The purpose is to check for needed repairs, safety comfort and longevity of your car. We check for leaks, damage, worn parts, brakes, tires, wheels, lights, fluids, steering, engine, transmission, suspension, exhaust, belts, etc. See Haik’s Major and Minor Service and Inspection below. Haik’s Minor Service is more limited in scope. It includes oil change, safety check and fluid adjustments. It is not intended to replace the larger services. It is a supplemental service recommended between the larger service intervals. See Haik’s Minor Service below. In the mid-level and major inspection, every system is inspected to make sure it is behaving properly. We visually inspect the body, chassis, interior, undercarriage, and engine compartment. We check the brakes, steering, lighting, cooling system and fluid levels. We check for any malfunctions such as fluid leaks, grease leaks, worn or broken parts, uneven wear, cracked drive belts and leaking exhaust. We function test all the lights, horn, windshield washer system, battery and alternator. We read your onboard computer for any possible trouble codes stored. Wherever possible, we try to exceed the service work set by the vehicle manufacturer to make sure nothing is overlooked or neglected. If this routine inspection is not performed, and corrective repairs not made, there could be serious and expensive consequences as a result, such as a worn part breaking or a hydraulic unit running dry because of a leak. 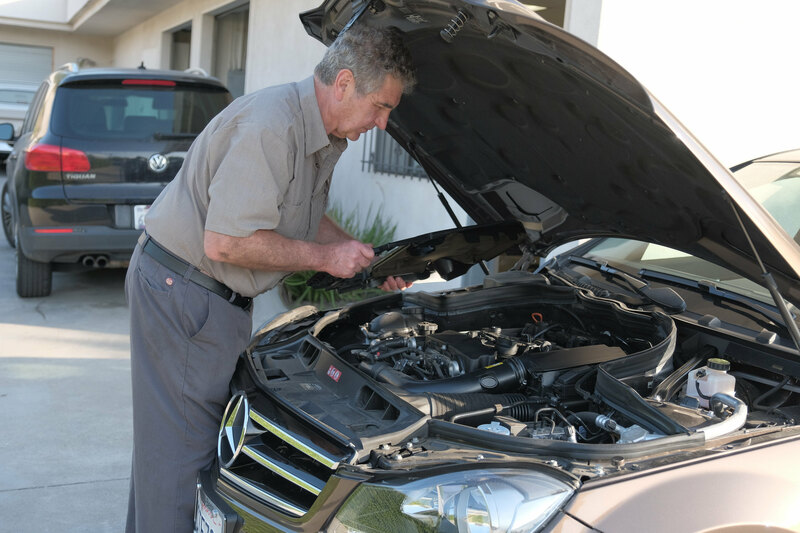 The service operations portion of the service addresses such basic items as engine oil and filter change, adjusting fluid levels, replacing the air filter, pollen filter, wiper blades, tire inflation, tire rotation. Each level of service includes various operations. When the service is completed, we reset the service indicator. Modern cars have several onboard computers. These computers monitor the various system operations and record malfunctions. These fault codes (diagnostic trouble codes, DTC), are stored in the various computers. During routine mid-level and major service, we interrogate the “engine control module” and analyze any codes we find. It is important to do this, since not every code activates the check engine light but can still cause problems. Checking and correcting these problems is a part of proper maintenance. Other systems such as ABS (anti-lock braking system) or SRS (supplemental restraint system, commonly known as air bag and seat belt system) we check only when a warning light appears. These systems will set a warning light any time a fault occurs within that system. Before the car leaves the shop, we test drive the vehicle to make sure all driving functions are in proper working order: steering, braking, shifting of the transmission and engine power. We also listen for unusual noises or vibrations and evaluate general overall performance at this time. Services and inspections are vital to the health of your car. Our customers who have their cars regularly serviced have few breakdowns. They are usually not the ones who find themselves spending a night out of town in a motel waiting for their vehicle to be repaired by a mechanic who does not know their car and may not be familiar with their type of vehicle. This car-check inspection is performed for the purpose of determining the maintenance status of a car. It can be carried out in the course of general servicing or as a stand-alone procedure for the purpose of buying or selling a vehicle, or just to know what shape your car is in. It is also used by some customers to determine how long they wish to keep the vehicle. *Note: An inspection does not include any service work or adjustments to the car. *Note: Inspection does not include diagnosis of problems such as determining the source of an engine misfire or an oil leak. Diagnosis can be time-consuming and is billed separately. *Note: Tire pressures are adjusted according to C.A.R.B. (California Air Resources Board) regulations for the purpose of reducing fuel consumption and air pollution. Tire Pressures - adjust all including spare according to C.A.R.B. requirements. *Note: Difference between Major and Mid-Level Service—Mid-Level does not include air filter replacement, cabin filter replacement or tire rotation as in Major Service. More than an oil change. This minor service is designed to maintain vehicle between mid-level and major-level service intervals. It is not designed to replace the larger services. Tire Pressures - adjust front and rear according to requirement of C.A.R.B. *For Repairs see our Repairs page. Timing belt for Audi and Volkswagen See Timing Belt on our VW page or our Audi page. Air-conditioning service is the replacement of refrigerant (R12, R134a, etc.) in the A/C system. This replacement is called evacuate and charge A/C system. It is not routinely performed since the refrigerant does not significantly degrade with time. Poor cooling performance is most often caused by loss of refrigerant from the system. This indicates either a leak in the system or that someone has removed the refrigerant. In order to make the air conditioning blow cold again, the necessary repairs must be performed. For more, see Air-Conditioning System (lack of cooling). The importance of an engine air filter is to filter incoming air of dust and other abrasives which will cause excessive wear and damage to your engine cylinders. A battery service comprises topping off the battery electrolyte (most new batteries are sealed however), cleaning the battery terminals of corrosion, checking the battery charge and condition with a special charging system test meter, charging the battery if necessary, and checking the alternator charging output. A dead battery or low battery charge is the most common battery problem. This occurs from one of four conditions—the battery has sat unused for several weeks, the alternator is not charging the battery, the battery is defective or there is an electrical draw on the battery, meaning some accessory in the car is staying on and draining the battery while the engine is not running. If the battery charge is low, charging the battery must be done before any further testing can be performed. The draw test is carried out in order to determine if any electrical unit is staying on after the ignition is turned off. Because of modern automotive electronics, many computers do not immediately fall asleep. Sometimes they remain "conscious" for nearly an hour. We must wait until they all sleep in order to determine whether a draw exists and, if there is one, then we must locate the source. For more, see Battery on Repairs Page. For more, see Battery on Repairs Page. The serpentine belt, so-called because it winds around every component on the engine which needs to be driven, should be checked and replaced at first signs of cracking or damage. Brake fluid should be changed every two years regardless of mileage. The reason is, brake fluid collects moisture from the air through the tiny vent hole in the brake fluid reservoir cap. This moisture (water) has a very low boiling point 100C or 212 F, while brake fluid (Dot 3 or 4) has a very high boiling point. When using the brakes frequently such as coming down a steep grade or driving aggressively, the heat from the brake pads riding on the brake discs (rotors) rises very high. This heat transfers from the pads and discs to the brake calipers and to the brake fluid inside the calipers. If there is much moisture in the system, the heat will vaporize the moisture in the brake system, and this steam could cause the pedal to fade or brakes to fail completely. Liquids do not compress much, but gas or steam compresses a lot. In three years, brake fluid will most likely contain enough moisture in it that the boiling point will have dropped enough to be potentially dangerous. Get your brake fluid changed every two years. See Break System on Repairs Page. The cabin filter (pollen filter) filters the incoming air into the passenger compartment when the fresh air mode is on, pulling air from outside. When the windows are closed and you want fresh air, the cabin filter traps debris, dust and pollen from entering the passenger compartment. We also use a charcoal activated filer rather than a paper filter. It costs a little more, but it is so much more effective against odors and other impurities. Car noises can be quite annoying. Often they are not serious. On the other hand, they are frequently a warning of worn or broken parts, or a condition which will worsen and cause greater expense to repair if ignored, or they can even warn of a dangerous condition. Noises vary from creaks and rattles to groans and whistles to knocks and growls and pops. If you have any doubt about the seriousness of a noise, I urge you to have it checked by a professional mechanic who is familiar with your type of car. See Noises on Repairs page. The first step in any repair is to diagnose the source of the problem. The vast number of failures which can set a check engine light make the task of finding the problem complicated. The diagnosis is a separate job from the actual repair since it requires reading the trouble codes with the shop scan tool (computer), analyzing the code, and then testing each component in the system which has failed. For more, see Check Engine Light on our Repairs Page. While some manufacturers claim a lifetime fluid, particles wear off the inside of the cooling system and contaminate the coolant, thereby causing more wear to such parts as the water pump seal. We recommend a coolant change every 40K miles or 4 years. While the system is serviced at that time, we also recommend a new thermostat. Proper diagnosis of a problem is essential. Without accuracy, repairs are just a matter of guess-work, and the replacement of a part may not fix the problem you paid to have repaired. Proper diagnosis is essential. It is often quite difficult and time-consuming. The system which has failed must be tested in its entirety. Each of its components must be tested and eliminated until the source of the problem is found. Expensive equipment and high-level skills are required for diagnostic service. Our shop scan tool (diagnostic computer) is a vital piece of equipment for electronic diagnosis and testing. However, without proper information and specifications, we wouldn’t get far. For this we subscribe to an online auto information service. See Latest Technical Information on our Home page. Diesel engines require much the same service as gasoline engines—air filter, oil change, fuel filter, and repairs when something goes wrong. The differential is the unit which powers the wheels and makes them turn. The unit is filled with gear oil and should be replaced every 60K miles or so. An automobile engine is very complex piece of machinery. It has a multitude of systems: mechanical, hydraulic, electrical, ignition, fuel, air intake, lubrication, exhaust, and all are controlled by electronics and computer. Repairs aside, the service items for the engine are relatively simple: oil and filter change, air filter replacement every year, coolant change every four years, spark plugs and fuel filter at longer intervals, and belts and hoses as needed. For more, see Engine Mechanical System on Repairs Page. The fuel filter filters the gasoline or diesel fuel entering the engine through the fuel injection system. It is very important. If contamination reaches the fuel injectors, it can cause damage. The filter should be changed according to schedule. While an oil change is merely an engine oil and filter change, an oil service is actually a minor service. In addition to an oil change, it provides a partial check out of your vehicle. We check safety items on the car such as tires, brakes, lighting, belts and fluid levels. An oil service is not be be confused with a larger service where more of the vehicle is inspected and more service items are performed. For details on oil service see Minor Service above. Although an oil change is usually a part of a service, we offer an oil change “only” for those who prefer to have their oil changed frequently between services intervals. The oil change “only” includes engine oil and filter replacement, oil change indicator reset and tire pressure adjustment. It does not include any check-up. *For check-up see services above. Today, even an oil change can be complicated. The various types of oils required by each auto manufacturer are vast. Any auto repair shop must know the type of oil required for the specific year and model of the vehicle. While all oils for modern cars today are synthetic, each has various viscosities, additives and ratings. Mercedes-Benz and Porsche require 5W40 synthetic engine oil, BMW and Mini require 5W30 synthetic engine oil, Audi and Volkswagen require 5W30 synthetic engine oil except in the turbo models such as 1.8T and 2.0 T engines in which recommended use is 5W40. Diesel engines from each auto manufacture requires still a different oil with a different ratings. The oil capacity is also critical. Overfilling may cause engine damage. Since many German cars between 2004 and 2010 did not have dipsticks, we must depend upon the onboard oil level sensor to tell us when the engine has the proper amount of oil. During an oil change we must have the exact specifications for oil capacity in order to fill it to the prescribed level. Service means the entire car, not just the engine, as is the case with an oil change. When a car is brought to us for service, we give the customer an estimate to perform the basic service which was requested. Once the servicing has begun, we use our shop scan tool (computer) to read the service menu item requests by car’s onboard computers. These service requests are stored in the instrument cluster control unit (one of the many onboard computers). Whether time or mileage related intervals, certain service items will be present. Examples of these service items are oil change, air filter replacement, cabin filter replacement, brake flush, spark plug replacement, coolant change, etc. Once we have the list of service items requested, we contact the customer with a revised estimate of work needing to be performed. If the customer accepts our recommendations, we proceed to address all the issues. If the costumer declines, we perform only the basic service which was agreed upon at the beginning. When the service is completed, we test drive the vehicle in order to see how it is performing. After the test drive, if everything is okay, we reset the service indicator for the next service. We then contact the customer to inform him/her that the service is completed. We discuss any repairs or services we’ve discovered which attention. Changing the fluid in the power steering system is a worthwhile service. Not only does the fluid become contaminated after years of operation, it also looses its viscosity. Several years ago, I had a BMW in with a very noisy power steering pump. The fluid was full. The customer had been told from a dealer that she needed a new p/s pump. I told her I couldn’t guarantee it, but a fluid flush might correct the problem. As it turned out, the noise disappeared after the fluid was changed. See Inspection (Car Check) above. Safety check includes checking all safety items in the car such as lights, brakes, wheels, tires, steering, wiper blades, etc.. This warning is actually a check engine light, not a service indicator. Todays spark plugs are not replaced very often. Most manufacturers recommend intervals between 40K miles and 100K miles. The high-grade metals such a platinum and iridium together with the optimized fuel efficiency makes spark pugs last a long time. The transmission should be serviced at regular intervals, at least every 40,000 miles. A transmission service for automatic transmissions involves draining the AT fluid, replacing the AT filter and pan gasket, and refilling the transmission with new fluid. The type of fluid is crucial and must be specific for the transmission. The amount of fluid is also crucial and must not be over or under-filled. Modern transmissions for German cars from 1996 onward are electronically controlled. Fluid level can only be checked from below the vehicle with a computer and only within a critical range of fluid temperature with the engine running. Usually there is no dip-stick on these transmissions. Since the transmission is such an expensive unit, it is wise to keep up with the services. While the term tune-up is out-of-date, however the concept of engine performance is very much alive. Keeping your engine running strong and performing properly is good for the longevity of your expensive engine, for vehicle power and acceleration for safety, and for the sake of our planet in maintaining lowest smog emissions possible. Oil change, air filter, spark plugs, fuel filter, belts, cooling system should all be in good order. Having the engine serviced regularly, allows the mechanic an opportunity to visually inspect belts, coolant hoses, vacuum hoses, engine gaskets for oil leaks, and other failures which may occur. When a modern engine fails to perform properly, the failure is not a matter of a routine service or tune-up, but rather a matter of failure in the mechanical, electrical or electronic system. In order to correct the problem of poor engine performance, the source of the failure must be diagnosed and the proper parts replaced or repaired. If your engine develops a misfire or runs rough, or a check engine light comes on, it is extremely important to see your mechanic as soon as possible in order to avoid unnecessary engine or catalytic converter damage. The failure could be electronic, mechanical, hydraulic or even lubrication. Repairs may be necessary. Windshield wipers are a safety item, not only in the rain, but at dusty times as well. When sunlight hits the dirt on your windshield, it can diminish your vision. Wiper blades and the windshield washer system should be in good working order at all times.